Brazil is immense in size, occupying over half the landmass of the South American continent and ranking as the fifth most populous country in the world. The country borders all but two states on the South American continent. However, Brazil differs in various ways from its neighbours due to the country’s colonisation by Portugal. Although independence was achieved in 1822, many elements of Portuguese culture have shaped Brazilian culture, such as naming practices, languages, artistic expressions and attitudes. Various other migratory patterns have also introduced many cultural influences that continue to shape Brazilian culture. Contemporary Brazil is a vibrant blend of diverse landscapes, ethnicities, cultures and religions. Unity is expressed through shared language (Brazilian-Portuguese) and attitudes such as collectivism, saudade (nostalgia and longing) and esperança (hope). Given the size and geographic position of Brazil, the country contains a diversity of landscapes and climates that influence distinctions between groups of people. Brazil’s landscapes are as varied as the experiences of the people who occupy the spaces – with the tropical Amazon in the North, the almost arid ‘outback’ in the Northeast, the wetlands in the West and the cool climate of the South. The rainforest and jungle of the Amazon is home to some of Brazil’s few remaining pockets of isolated indigenous groups. Brazilians often associate their identity with their place of birth in the country, thus reflecting the importance of one’s sense of place. Brazilians often categorise people based on their geographic location of origin and some may associate particular parts of Brazil with socioeconomic and ethnic groupings. 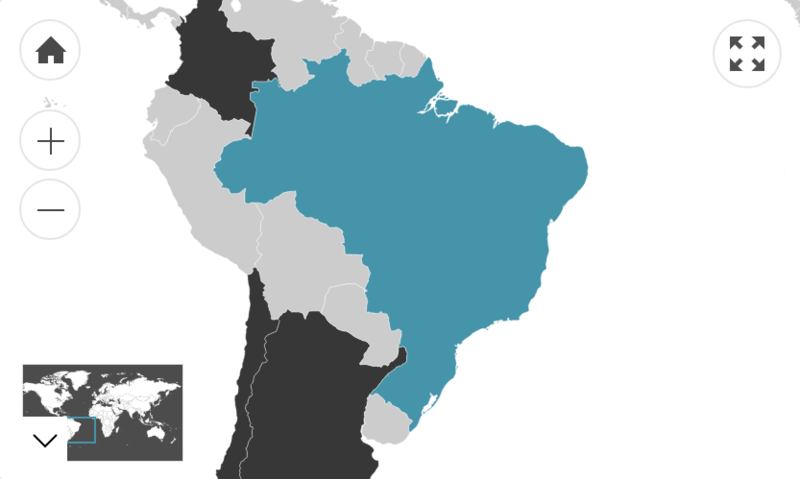 For example, one distinction often drawn is the ‘two Brazils’, namely northern and southern Brazil. The former is considered to be home to many members of the African and indigenous population and is at times thought of as ‘underdeveloped’. This is contrasted with the southern, supposedly wealthier part of Brazil that is home to many people with European ancestry. Another distinction sometimes expressed is that between ‘litoral’ (‘coast’), and ‘interior’ (‘inland’). To say someone is from the interior usually implies that they are from a rural area. However, this distinction is deceptive as there are large cities located far from the litoral. Differences are also evident within cities, whereby the city layout reflects ethnic, social and class distinctions. This generally manifests in the stark contrast between ‘favelas’ in the foreground, and high-rises in the background. Favelas (shanty towns located within or on the outskirts of Brazil’s largest cities) are home to roughly 6% of the country’s population. The makeshift housing typically forms when squatters situate themselves on vacant land at the edge of a city. Much of the plumbing and electrical wiring in favelas is improvised. Favelas are steadily increasing in size and number, and as a result of the crowded, unsanitary conditions, diseases spread quickly. These physical distinctions of space demonstrate the dispersed and tangible nature of inequality in Brazil. Moreover, favelas reflect the constant negotiation of space among various groups and peoples. Brazil’s incredible ethnic diversity reflects its history of migratory patterns. The country has embraced a medley of migrants from all over the world. For example, people from European countries (such as its coloniser Portugal and other European missionaries), the African continent (for instance, the colonial import of indentured Angolan labourers), and Asia (Japanese economic migrants). The migratory patterns have led to many Brazilians possessing mixed ancestry, expressed in the form of the ‘hidden hyphen’, such as ‘Afro-Brazilian’ or ‘Japanese-Brazilian’. Moreover, as different ethnicities have mixed, new generations of Brazilians with blended heritage have formed new ethnic identities. For example, ‘mulatto’ refers to Brazilians with a combination of European and African and/or Amerindian heritage. In the 1940s, the Brazilian social historian Gilberto Freyre declared Brazil to be a “racial democracy” whereby all citizens were considered equal in opportunity regardless of ethnicity. This discourse shapes much of how Brazilians understand their interactions with one another – as a unified culture with diversity at its core. A common perspective is that the mixed ethnic heritage of Brazilian society helps make the nation prosperous. Despite its ethnic diversity, a sense of commonality exists through the Brazilian-Portuguese language. The version of Portuguese spoken in Brazil reflects the country’s diverse people through the addition of numerous indigenous terms. The combination of pride in ethnic diversity and the shared language of Brazilian-Portuguese reflects a sense of ‘unity in diversity’. Although there is a general appreciation for diversity, some ethnic minorities suffer discrimination based on prejudice against their ethnicity. Despite such, Brazilians have generally supported the reconceptualising of multi-ethnic heritage as a source of pride rather than shame. Brazilian society tends to be stratified according to quite distinct socioeconomic groups often related to one’s ethnicity. The general pattern has seen those of darker skin to be more economically and socially disadvantaged. Meanwhile, those of lighter, usually of European heritage, tend to be part of the upper socioeconomic classes. Interactions between social classes are usually fleeting, occurring mainly through workplaces such as a businessperson interacting with a maid or driver. One example of the interactions between social classes is between those who do not engage in manual labour and those who do. The notion of ‘working with one’s hands’ is commonly thought to reflect a low socioeconomic status whereas those from the middle class, sometimes defined as those with a ‘colarinho e gravata’ (‘collar and tie’), generally do not engage in manual labour. Instead, middle-class Brazilian families commonly employ domestic servants to do the arduous tasks for the housewife (such as scrubbing the floor). Traditionally, social mobility is quite difficult in Brazil. While this has changed with the advancement of Brazil’s economy, many tend to stay within the same social class. A collectivistic attitude and sense of solidarity are characteristic of many Brazilian people. There is often a sense of pride in their ability to work together to shape their lived experiences rather than passively accept the status quo. The spirit of people power manifests in various ways – one example being the non-governmental organisation Movimento dos Trabalhadores Rurais Sem Terra, known in English as ‘the Movement of Landless Rural Workers’ (MST). With roughly one-quarter of the Brazilian workforce in the agriculture sector, MST serves to empower tenant farmers, sharecroppers, casual labourers and landless farmers. Among Brazilian civil society, there is a widely held belief that the government and law enforcement bodies are corrupt. Given the sceptical attitudes towards political institutions, collectivism in Brazil does not extend towards the government. When in a time of need, Brazilian citizens generally reach out to and depend upon family, friends or those within their community. Brazilians commonly take to the streets and protest as a form of resistance. Another central aspect of Brazilian culture is its ‘spirit’ that manifests through the expression of particular emotions. ‘Saudade’ is a term that refers to a combination of longing, nostalgia and melancholy. It reflects the desire for someone or something that is far away or unattainable, as well as reminiscing about a distant memory. Brazilians may feel saudade when they are living abroad and feel homesick or separated from a loved one. Saudade is not only an emotional response, but also a state of mind. Artistic expression in Brazil fosters and thrives on saudade as a source of inspiration for artists, musicians and poets. Hope (‘esperança’) is another driving sentiment integral to the Brazilian spirit. The notion of hope has deep associations with religion. For example, the commonly used phrase, “se Deus quiser” (“God Willing”), implies hope as well as a lack of control over the future. The Portuguese word for hope, ‘esperança’, refers to a mixture of faith, expectation and destiny. Often exuding a sense of hope, Brazilians are typically light-hearted and joyful as they try to enjoy the present moment. Events such as Carnaval and Festa Junina reflect the Brazilian attitude of being able to celebrate in the face of adversity. One of the most notable manifestations of saudade and esperança is the vibrant music culture. The energetic music culture of Brazil has globalised, becoming a distinctive hallmark of Brazilian culture for those unfamiliar with the country. The two most familiar music genres are the Bossa Nova and Samba. However, these two particular music genres are only a small part of the music culture in Brazil. Much like all else in Brazilian culture, music expression varies from region to region and plays an important role in Brazilian culture and identity. This figure refers to the number of Australian residents that were born in Brazil. Of those who speak a language other than English at home, 90.0% speak English fluently.